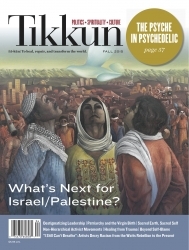 This is the Fall 2015 issue of Tikkun Magazine. The price includes shipping (you will not see a choice of shipping options when you check out if this is the only product you buy). International Shipping: If you are outside of the United States, please use the pull-down menu and select International Shipping. It costs $6 more to ship the magazine internationally (we'll use First Class mail). To access the tools we need to transform our society, we must overcome anti-intellectualism on the left. Let’s reforge the link between head and heart. Secular society is narcissistically stuck in the now. As progressives, we must focus instead on how we’ll be viewed by future generations. To overthrow the alienation and false needs of capitalism, we must imagine a culture of love, fearlessness, and honor for the sacred—then start building it. The meaning of the virgin birth got lost in translation: it wasn’t meant to vilify female sexuality but to echo a prophetic challenge to oppression. 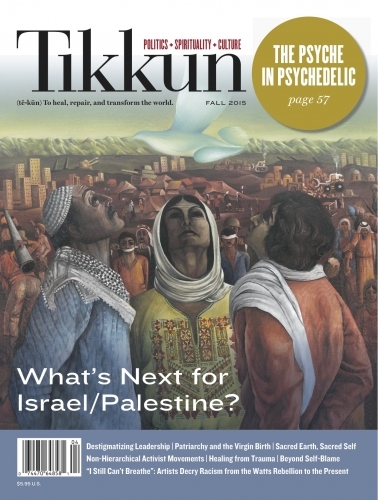 SPECIAL SECTION: WHAT’S NEXT FOR ISRAEL/PALESTINE? Visit our online exclusives page to read the powerful web exclusives associated with this forum, including contributions from Tirzah Firestone, Alon Ben-Meir, and Carol Ascher.